Huw Williams reports on a memorial service in the Highlands to commemorate the Free French troops involved in the Normandy landings. 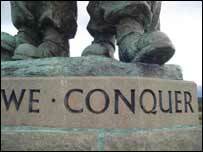 The words have lost none of their power, even after 60 years - "D-Day has come". John Snagge's voice crackles out from the recording in the BBC archive. "Early this morning the Allies began the assault on the north western face of Hitler's European fortress". That assault involved tens of thousands of allied troops, "supported by strong air forces", in storming the northern coast of France. But not everyone realises that amongst them were just 177 Free French, attached to the British commandos who landed on the eastern end of Sword beach, early on 6 June, 1944. They were named Kieffer commandos, after the officer who led them, Phillipe Kieffer. And like all the allied commando forces, they had trained at Achnacarry Castle, near Spean Bridge. That history is now marked by the Commando Memorial, a huge statue, which looks across to the imposing heights of Aonach Mor and Ben Nevis. 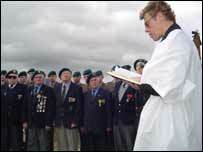 The memorial was the venue for a commemorative service involving 10 of the 33 surviving Kieffer commandos. Wearing their green berets, and proudly displaying their medals, the old men stood alongside Scots veterans and serving marines from the Faslane base on the west coast of Scotland. A military padre led them in the Lords Prayer in French. And they prayed once again the so-called Kieffer Prayer, which many of them said as their landing craft approached the Normandy Coast, and they prepared to engage the enemy. "Lord, I shall be very busy this day", it says with masterly under-statement. "I may forget thee. But do not thou forget me. Amen." It was a day of renewed friendships, and high emotions. One of the veterans, Leon Gautier, told me he remembered the moment when one of his comrades first saw France, approaching on the horizon. "It was a big lot of emotion really, to see France there", he said. "We had a job to do. We knew what we had to do." And, he said, their craft had been ordered to edge ahead of the others as they approached the beach. It meant they landed first. Their boots - Free French boots - were the first on occupied French soil. "The commanding officer told us to go first, please", he remembered. "We were very grateful to him, and we thank him again". Phillipe Kieffer's daughter, Dominque, was also at the service. She told me that the role of the force her father commanded is not much understood, even in France. But the story is becoming more important, as France prepares to host ceremonies to mark the 60th anniversary of D-Day, in June. "Of course everybody in France knows about the Allies". But, she added, "a lot of French people don't even know there was a little group of French people there." This year "at last", she said, "we're going to say thanks to them". During the service, a Scots veteran laid a wreath at the Commando Memorial. In the familiar words, he promised "at the going down of the sun, and in the morning, we will remember them". The congregation answered "we will remember them". 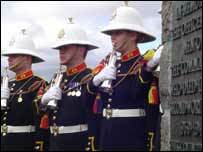 The buglers played the Last Post. And one of the veterans brushed a tear from his eye. Around an hour later, the crowds had dispersed, and the photographers and camera crews had gone. I was still in the car park, finalising a report on the service, as a car full of students from one of Scotland's most prestigious universities arrived. They were on their way north, for a day out at Loch Ness, but they had stopped off at the memorial out of curiosity. I got chatting to them, and they were curious to hear more about the place, and the ceremonies that had been taking place there earlier. "So, what was D-Day? ", one asked.